Only stick a spoon on your nose in private, otherwise, I'll point and laugh. Yesterday, I touched on the subject of table manners. That got me to thinking; why not continue on with the feeding theme? I mean, we all eat, and we all use cutlery, so, today, I'm going to tell you where it comes from. Let's start at the beginning. The first piece of cutlery that humans used actually predates humans. Homo Habilis, Homo Erectus, and Neanderthals all used this device before Homo Sapiens appeared on the scene. I'm talking about, of course, the knife. For a long time, about 2 million years, in fact, the knife was the only tool most people had. They used the knife for everything. Killing animals, gutting and skinning them, cutting firewood, cutting a spit to roast the animal on, killing the stranger who tried to steal your food, and finally, slicing the done bits off your roasting beast. The same knife was used for everything. And, no one really knew about cleaning their knives. So, I guess you could call that gross. As time went on, the knives evolved from stone into metal. First bronze, then iron, then steel. But the usage of the knife didn't really change much. A knife was the only utensil people used to eat with besides their hands. In the mid 17th century is when the first table knife, with a rounded end, appeared. At the time, hands and knives were still the primary utensils. And, in high society, a Parisian nobleman was disgusted by the habit that people had of using the sharp point of their knives to pick their teeth. So, he commissioned a set of flatware with the knife points rounded. They were an immediate hit amongst the rich and fabulous. Soon everyone had to have a set. Now, the spoon isn't as old as the knife. It dates back about 20,000 years. It was first made of wood or bone, and was used to get liquids out of a bowl that was too thick to slurp out, but too runny to grab. For most of human history, and even after the spoon appeared on the scene, the preferred method of consuming soup was to drink it out of the bowl. Spoons were used as serving utensils, mostly. In the Middle Ages in Italy, spoons were made so the handle was in the shape of one of the apostles, and were generally made from silver. The tradition was to for the wealthy to give a spoon featuring a child's patron saint as a christening gift. This is where the phrase, 'born with a silver spoon in his mouth' comes from, as only the rich and privileged could afford an apostle spoon. Around the time of the renaissance, spoons became more widely used. As people regained culture, they grew tired of people slurping out of a bowl. Slurping from a spoon was not as noisy. And finally, we come to the lowly fork. The utensil most people use the most was actually the last on the scene. And at one time, you would be mocked for using a fork. 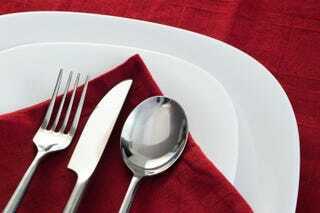 Prior to the fork arriving on scene, the Romans formalized a standard for eating. Common people grabbed food and ate it with all 4 fingers and the thumb of one hand. Nobles were to use only the thumb and first two fingers. They called this, surprisingly, the three finger rule. And as a rule, it held sway for more than 1,500 years. (before the Romans, people grabbed food however they felt like it). The first forks found were actually miniature farmers pitchforks. They date back to 4,000 BCE, and were too small to be used for eating. Historians think they were more for harvest festivals than for food. The first forks used for eating didn't appear until the 11th century in Italy. The first forks had two tines, and you really didn't want anyone to find out you used one. See, the clergy had this wild idea that only man's fingers were pure enough to touch God's bounty, and by using a fork, you were insulting the gift God freely gave. In fact, in 1164 the Archbishop of Canterbury introduced the fork to the Kings court. He had to flee England to avoid trial by the Lay Courts. He could only return after a pardon by the king himself. While forks were owned by nobles, they were made of gold and silver, and they weren't used for eating. English nobles used them for duels. It wasn't until the 18th century and the start of the French Revolution that the fork started being used for eating more regularly. The French nobility decided to use forks to eat with as it would separate them from the commoners, as forks were expensive. While the fork didn't cause the French Revolution, it was another example of the aristocracy trying to keep the commoners down in their places. As the revolution progressed, the revolutionary courts would accuse the nobility of some crime against the citizens and have them beheaded. They would confiscate their estates, and the commons started using forks to show there was no difference between the nobles and the commons. And, by the start of the 19th century, the use of the fork had spread to most of the world as it was seen as a symbol of destitution to not use a fork. So, there you have it. Now you know the history of the silverware you use. I tried to make it gross, but I couldn't. I guess you guys got lucky today.